Truly a hidden gem, the Bealach Óisín Ballaghisheen Scenic Drive and Cycle Route is a stunning 80km or 50 mile long (2-3 hour driving) route from Killarney to Waterville or vice versa through the centre of the Iveragh Peninsula to some of the most remote, scenic and mythology inspired parts of county Kerry. Leaving Killarney the route takes the Ring of Kerry for a short distance passing its most famous sites including Killarney National Park, Muckross House and Garden, Torc Waterfall, Ladies View and Molls Gap before you firstly reach Bealach Beama. An alternative to the world famous Ring of Kerry and Wild Atlantic Way drives which take the coastal route around the Iveragh Peninsula this scenic drive is simply spectacular. For the return journey you can either head north and join the Skellig Ring and Ring of Kerry route back through Glenbeigh and Killorglin or south to Waterville, Sneem and onto Kenmare. Either way you are blessed with some of the best road trips in Ireland and the world!!! Leaving Killarney you also have the option to skip the Bealach Beama section of this route and skirts around the MacGillycuddy's Reeks Mountains, the highest in Ireland, and then continue onto Bealach Oisin (in Irish) or Ballaghisheen Pass where there are amazing views east toward the Reeks and west towards Waterville and the stunning coastline. This will shorten the route by about 20km. 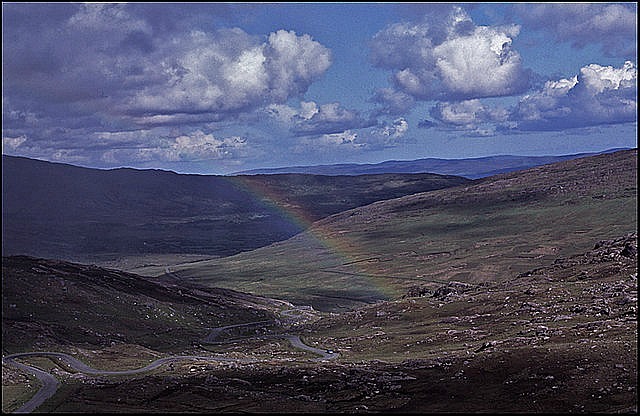 The Bealach Oisin Pass or Gap gets its name from Oisin, the son of the legendary warrior Fionn MacCumhail. Oisin was a poet and one of the Fianna warriors, who recounted the tales and legends of the Fianna. The main legend surrounding Oisin is the story of his journey to Tir na N'og, the mythical land of Eternal Youth. The story tells of how Irelands ancient warriors the Fianna, where hunting on the shores of Lough Leane in Killarney, when Oisin instantly fell in love with a beautiful blond riding a white horse; Niamh Cinn iir (Niamh of the Golden Hair). She invited him to her land of Tir na N'og under the waters of Lough Leane in Killarney, where nobody grew old and spring was eternal. Though Oisin was very happy in Tir na N'og with Niamh, after what he thought to be three years, he wished to visit his family. But Niamh warned him that in the land of mortals he had been away 300 years and that if he returned and touched the land again, all those years would return to him. So Oisin set off on horse back careful not to step on the ground. He discovered the land much changed, hundreds of years had gone by, the Fianna were long gone, the people of Ireland had grown small and weak and Saint Patrick was converting people to Christianity and churches were being built. On his return to Lough Leane, Oisin came across a group of men trying to clear a boulder from the path, along what is now known locally as the Bealach Oisin Pass - Oisin's Path in the mountains close to Killarney. As one of the mighty Fianna, Oisin claimed he could move it with one hand and took up the challenge from the men. Oisin remained on his horse and to the wonder of the mortals began moving the huge rock with one hand. But as he did so, the stirrup on Oisin's horse broke sending Oisin falling to the ground and the mighty warrior was instantly transformed into an old man.